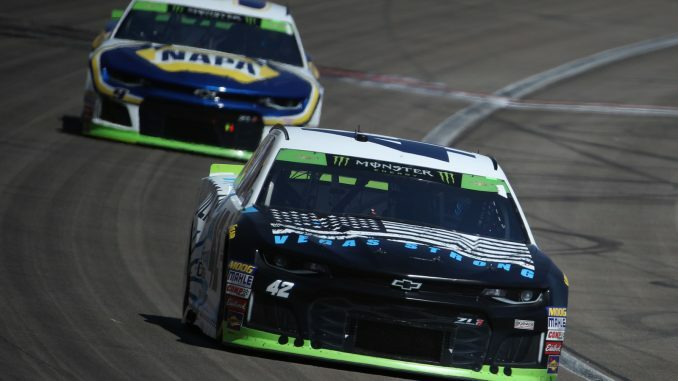 The late caution flags in Sunday’s South Point 400 at Las Vegas Motor Speedway were just what Brad Keselowski needed. But they were inimical to the winning chances of Kyle Larson, who couldn’t match Keselowski’s short-run speed. Larson had just passed Keselowski for the top spot on Lap 245 of 272, but two laps later, Denny Hamlin spun off Turn 4 to bring out the ninth yellow flag of the afternoon. Three more cautions followed in short order, and Larson never had a chance to use his long-run advantage. Instead, Larson finished second in a two-lap overtime dash, 1.276 seconds behind Keselowski. The runner-up finish was Larson’s sixth of the season without a victory. “I needed it to stay green there (after the pass of Keselowski),” Larson said. “I felt like I could have won the race right there, because he was really good on the short run and I was terrible on short runs today, but once I could get the top (lane) going, I was really good. “Right when I moved up top in (Turns) 3 and 4 and pulled away, the caution came out. I felt like I was going to be able to stretch it. I felt like the 78 (Martin Truex Jr.) would probably get by (Keselowski) at some point and then maybe chase me down.